Get of Sire Winner at AOA Nationals 2017! Daughter RGSA Eleanor! Futurity 2016 Grey Color Champion! GLR Nasca has a " who's who" for a pedigree with some well known genetics on her ARI certificate of Rockstar, Torbio, Rene, Ramilo, Maria, 4P Susurro, Sweet Foxfire Jax, Lethal Weapon, and Dee Dee Jax. She has solid colored genetics from her mother's side and is the daughter of our 5 time Color Champion, 3/4 Accoyo Young Felipe. She was shown once in 2009 as a six month old at AOBA Nationals and was 1st in her class. She is a high luster girl with a micron count of 19.2 . She had a beautiful jet black son, GLR Nico who was 2nd at the AAA Futurity, 1st and Rerserve Color Champion at MAPACA and 2nd in a class of 14 at AOBA Nationals as a juvenile and in 2013, as a yearling, GLR Nico was the AOBA Black Color Champion. Nacsa had a beautiful fawn daughter in June 2013, and is currently bred back to GLR Rastamon for a June 2014 cria. GLR Nico is standing stud in Colorado, right now! Close up your open girls with a breeding to this True Black boy! His progeny needs no introduction, they continue to blow away the competition in the show ring and it is easy to understand why! With his genetics and pedigree, he continues to stamp LUSTER and LOCK on everything! Nico has blown us away with his ablity to pair extremly well with Macgyver lines! Our best pairings with Nico have been from Macgyver lineage girls! Between confimation, lock and luster, Nico has not let us down. Below are some of his amazing offspring and we have had a hard time hanging onto these guys and you will be able to see why! On top of being a wonderfully easy boy to handle and breed this boy, has given us several offspring to be very proud of! And because Nico's offspring are so Wildly popular, we have only been able to keep a few long enough to be able to biopsy. But his kids did not dissapoint us at all, in fact right after biopsing these guys they were sold! We have only been able to retain 1 of our Nico kids for our own and are very proud to keep her! Nico kids are vibrant, healthy, and tend to be nursing within 15 minutes of birth! They are energetic and thrive!!! RGSA Eleanor; Sold before we were able to Biopsy. Now owned by Brian Barfield & Katie Silver. SOLD at Futurity 2016 for $10,500! Eleanor has gone on to produce her first offspring for Brian & Katie, a wonderful bay black female! RGSA Coppola; Sold before we were able to Biopsy. Now owned by Michael Frankel & Sandra Wallace. Coppola was True Black Futurity Reserve Champion 2017! 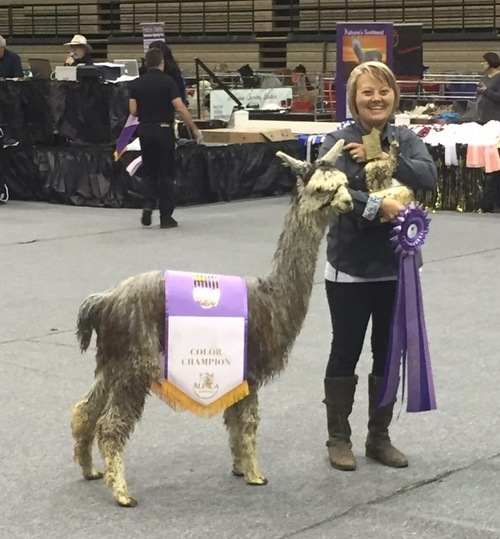 Coppola has begun his breeding career with Michael & Sandy and expects his first crias 2019! Rogue's Archemedes; Up and coming Grey Stud Muffin! This boy will be extremely hard to sell! A true clone of his father except in Grey! 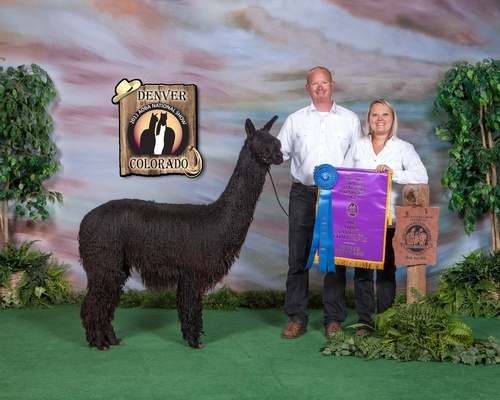 This boy will hit Rogue Suri Alpacas Herdsire row 2019! Rogue's Legend; Up and coming Nico Stud Muffin. 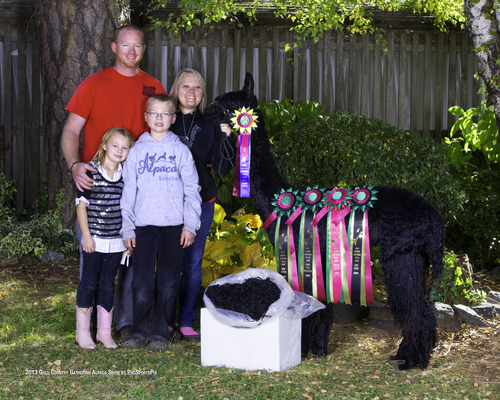 This boy swept the 2018 fleece shows winning Color Champion at both AOA Nationals and Suri Network Fleece show! 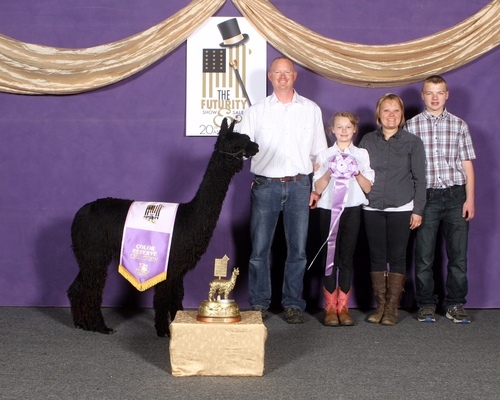 He also won Best Bred & Owned at Alpacapalooza 2018! This boy is still available for sale to a discerning breeder looking for quality! I have no doubt when old enough this boy with have an amazing biopsy! 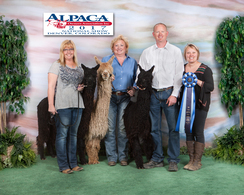 GLR Nico is now proudly owned with Shambalah Alpaca Ranch & Triple H Ranch! Reserve Champion CABA 2015 Halter in 3rd FLEECE!